Zoom F8: Good Enough for Pros? Zoom's new F8 eight input field recorder seems to be aimed at professional recordists, location sound engineers, and professional sound designers. This seems to be the message from Zoom's marketing group. And indeed, the Zoom F8 has many of the features a professional sound engineer would expect in a modern digital field recorder. But not all of what they'd expect. First, let's define "Pro" for the purposes of this piece. 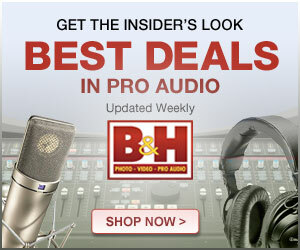 By pro, I mean a person who makes the majority of their personal income as a sound engineer or recordist, or designer. By this definition, I am not a pro sound engineer. I'm a semi-pro. Also, I'm only putting these thoughts down to help clarify things for myself and perhaps for other curious audio for film enthusiasts. I'm not setting myself up as the definitive word on this matter or any other. These are just my thoughts, from my semi-pro perspective. From the perspective of this definition, most pros will probably not choose to use the Zoom F8 as their primary field recorder. This is not a criticism of Zoom and I am not saying that the F8 is a bad device that has no use for anybody. I'm just saying that most pros will find this device lacking in a few key areas that make it less than the optimal tool for their jobs. They are better served by Sound Devices or Zaxcom recorders and mixers. These factors are things that are generally important to pros. Remember, these guys spend a lot of long days with their recorders and mixers. That they sometimes seem so picky makes a little more sense when you consider how much time they spend using these devices and the fact that their careers are on the line when they miss too many takes. However, does that mean that pros won't buy Zoom F8s? I think that some of them would consider having one for backup purposes. Lots of pros already have one or another of the Zoom Handy recorders. They don't use the Handy recorders all that often but they can be useful sometimes. And for those of us that are semi-pro, or one-man-production-crews, doing smaller budget projects like corporate videos, is this thing useful for us? The pre-amps on the Zoom F8 seem very good to me after the subjective tests I've done. The build quality is quite good. That I can use a proper pro-level battery like an Anton Bauer to power the F8 via its hirose input for well over 20 hours even when phantom powering multiple mikes is great. Timecode on the F8 is seemingly as good as a Sound Devices 744T. So in short, just because this device isn't totally up to par for most pros as a primary field recorder, doesn't mean that it isn't useful for semi-pros and enthusiasts. I have no regrets spending $1000 for mine.